I grew up on the fringes of the Bohemian Forest, where Wolpertinger roam and people speak a vernacular so strong it’s considered its own language by some. I’ve been lucky enough to make a living from science fiction for most of my life by selling it, translating it, and writing it. I learned how to tell stories while translating and line-editing wonderful authors, and it was one of them, Ken Scholes, who encouraged me to go and try to write in English. 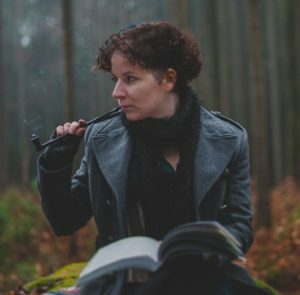 As a reader and a writer, I love to explore the borderlands between fantasy and science fiction, and I’m forever drawn to myth while grounding myself in folktale and everyday culture. I love board games, video games, and hiking, and I almost became a biologist (ask me about whales! lizards! newts! solitary bees!) I graduated in linguistics and cultural studies instead, which was equally fascinating, and it somehow covered my interest in EVERYTHING plus languages. I live in Regensburg, a medieval town near Munich, Germany, with narrow alleyways and five months of constant fog per year, and I love traveling too much to be an eligible caretaker for furry or scaly friends. My favorite German word is Sehnsucht: an addictive yearning made of equal parts melancholy and madness, for something that’s never where you are.